What is Polyvinyl Chloride (PVC), and What is it Used For? Polyvinyl Chloride (PVC) is one of the most commonly used thermoplastic polymers in the world (next to only a few more widely used plastics like PET and PP). It is a naturally white and very brittle (prior to the additions of plasticizers) plastic. PVC has been around longer than most plastics having been first synthesized in 1872 and commercially produced by B.F. Goodrich Company in the 1920s. By comparison, many other common plastics were first synthesized and became commercially viable only in the the 1940s and 1950s. It is used most commonly in the construction industry but is also used for signs, healthcare applications, and as a fiber for clothing. PVC is produced in two general forms, first as a rigid or unplasticized polymer (RPVC or uPVC), and second as a flexible plastic. Flexible, plasticized or regular PVC is softer and more amenable to bending than uPVC due to the addition of plasticizers like phthalates (e.g. diisononyl phthalate or DINP). Flexible PVC is commonly used in construction as insulation on electrical wires or in flooring for homes, hospitals, schools, and other areas where a sterile environment is a priority, and in some cases as a replacement for rubber. Rigid PVC is also used in construction as pipe for plumbing and for siding which is commonly referred to by the term “vinyl” in the United States. 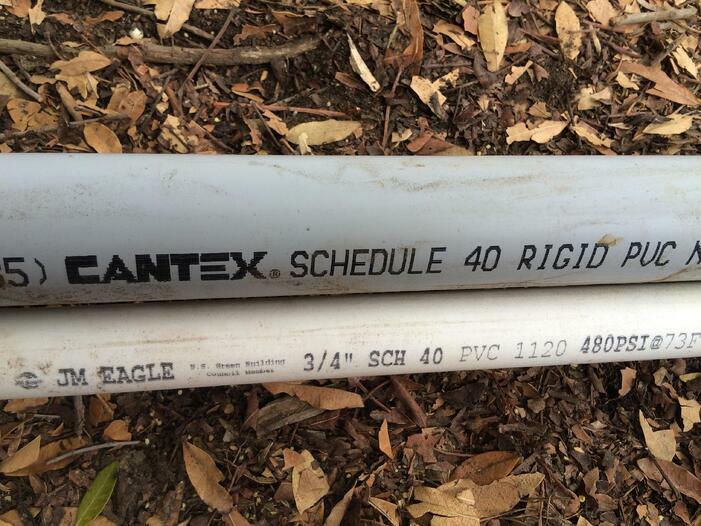 PVC pipe is often referred to by its “schedule” (e.g. Schedule 40 or Schedule 80). Major differences between the schedules include things like wall thickness, pressure rating, and color. Some of PVC plastic’s most important characteristics include its relatively low price, its resistance to environmental degradation (as well as to chemicals and alkalies), high hardness, and outstanding tensile strength for a plastic in the case of rigid PVC. It is widely available, commonly used and easily recyclable (categorized by resin identification code “3”). What are the Characteristics of Polyvinyl Chloride (PVC)? Economics: PVC is readily available and cheap. Hardness: Rigid PVC is very hard. Strength: Rigid PVC has extremely good tensile strength. Polyvinyl Chloride is a “thermoplastic” (as opposed to “thermoset”) material which has to do with the way the plastic responds to heat. Thermoplastic materials become liquid at their melting point (a range for PVC between the very low 100 degrees Celsius and higher values like 260 degrees Celsius depending on the additives). A major useful attribute about thermoplastics is that they can be heated to their melting point, cooled, and reheated again without significant degradation. Instead of burning, thermoplastics like polypropylene liquefy, which allows them to be easily injection molded and then subsequently recycled. By contrast, thermoset plastics can only be heated once (typically during the injection molding process). The first heating causes thermoset materials to set (similar to a 2-part epoxy) resulting in a chemical change that cannot be reversed. If you tried to heat a thermoset plastic to a high temperature a second time it would simply burn. This characteristic makes thermoset materials poor candidates for recycling. Why is Polyvinyl Chloride (PVC) used so often? Rigid PVC in particular has very high density for a plastic making it extremely hard and generally very strong. It is also readily available and very economical which combined with the long-lasting characteristics of most plastics make it an easy choice for many industrial applications like construction. What Are The Different Types of PVC? Polyvinyl Chloride is widely available in two broad categories: rigid and flexible. Polyvinyl Chloride for Prototype Development on CNC Machines, 3D Printers, & Injection Molding Machines: There are two main issues working with PVC that make it fairly problematic and not generally recommended for use by non-professionals. The first is the emission of toxic and corrosive gases when melting the material. This happens to some extent or another while 3D printing, CNC machining, and injection molding. We recommend you take a look at the MSDS data sheets for different chlorinated hydrocarbon gases like chlorobenzene and discuss the production process with a professional manufacturer. Second is the corrosive nature of PVC. This is problematic when PVC is repeatedly coming into contact with metal nozzles, cutters, and/or mold tools that are made from a material other than stainless steel or some other similarly corrosion resistant metal. Polyvinyl Chloride is available in filament form as a plastic welding rod (the material used for welding) but it is not presently retrofit for specific use in 3D printing. Although there are a growing number of plastics and plastic substitutes available for 3D printing, by far the two most common are still ABS and PLA. At Creative Mechanisms we typically 3D print with ABS. For a list of reasons why and a comparison of the two most common 3D printing plastics (ABS and PLA) for 3D printing read here. Polyvinyl Chloride can be cut on a CNC machine but any machinist who has tried has probably experienced degradation in the cutter depending on the material it is made from. PVC is very corrosive and abrasive and cutters that are not made from stainless steel or a comparably corrosive resistant material are likely to deteriorate over time. Polyvinyl Chloride can be injection molded just like other plastics but the inclusion of chlorine in the material complicates the process. This is because melted PVC can give off a corrosive toxic gas. Accordingly, shops need to be equipped with sufficient ventilation systems. Those that aren’t are likely to be hesitant to work with the material. Additionally, special corrosive resistant materials like stainless steel or a chrome plating are required for the mold tool when injection molding PVC plastic. Shrinkage in PVC tends to be between one and two percent but can vary based on a number of factors including material durometer (hardness), gate size, holding pressure, holding time, melt temperature, mold wall thickness, mold temperature, and the percentage and type of additives. PVC can pose a health hazard when it is burned as it emits hydrogen chloride (HCl) fumes. In applications where the likelihood of fire is high, PVC free electrical wire insulation is sometimes preferred. Fumes can also be emitted when melting the material (such as during prototyping and manufacturing processes like 3D printing, CNC machining, and injection molding). We recommend you take a look at the Material Safety Data Sheets (MSDS) for different chlorinated hydrocarbon gases like chlorobenzene and discuss the production process with a professional manufacturer. Polyvinyl Chloride is readily available and relatively inexpensive. Polyvinyl Chloride is very dense and thus very hard and resists impact deformation very well relative to other plastics. Polyvinyl Chloride has very good tensile strength. Polyvinyl Chloride is very resistant to chemicals and alkalies. Polyvinyl Chloride has very poor heat stability. For this reason additives which stabilize the material at higher temperatures are typically added to the material during production. Polyvinyl Chloride emits toxic fumes when melted and/or subject to a fire. Although there are some shortcomings, Polyvinyl Chloride is a great material overall. It has a unique blend of qualities that make it particularly useful for the construction business. What are the properties of Polyvinyl Chloride?